Rumours of shops selling Death Magnetic a day before its official release were running rife through the Metallica forums this morning, and, as it's day 4 of Metallica week on MusicRadar, we took it upon ourselves to investigate. 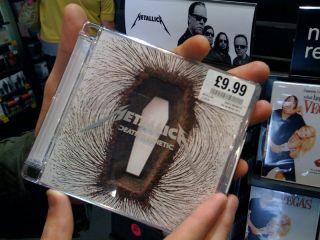 One intrepid trip to HMV (our local record shop) later and we are the proud owners of a shining copy of Death Magnetic. The much-publicised official worldwide release was supposed to be Friday 12 September and, according to other Metallica moles, HMV aren't the only store to get it wrong. In the haze of buying excitement, we managed to ask the HMV attendant if Death Magnetic had been flying off the shelves: "We've sold quite a few actually, but I don't think many people know that it's out today." Really? Neither did the rest of the world! Speculation that Scottish rockers Glasvegas' eponymous debut album was selling like hotcakes this week has raised concerns that Metallica's latest might not catch up. Perhaps the band got wise to this and demanded shops sell Death Magnetic a day early to avoid the disappointment of not landing the top-spot on its first week of release. Or, more cynically, perhaps Metallica had this planned all along.